Weekend Cookbook Challenge #13 – In With The New! Wow, folks. 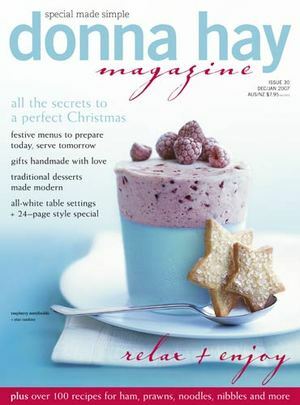 You really outdid yourself for this edition of Hay Hay It’s Donna Day – The Souffle Challenge. I stopped counting somewhere around 30! There are so many great entries, stories and recipes. I’m happy to report that most people faced the challenge with bravery…and came out on top! I also loved the photography for this edition of HHDD – you all weren’t afraid to get right in there and get close! It made so many of your recipes look so appetizing and delicious. Kudos to everyone! So now for the hard part: the voting! I don’t envy everyone trying to decide between all of these great posts! Please send an email to runningwithtweezers@gmail.com with your winning entry by February 10th. That’s the day that votes will be tallied and a winner – and the host of Hay Hay It’s Donna Day #10 – will be announced. Paul at EatNZ starts us off with a gorgeous Chocolate Souffle – it looks delicious *and* beautiful! Lara of Seattle’s Cook and Eat submits her (as always) beautifully captured Sweet Lime Souffle with Lemon Rosemary Syrup. Anne at A Foodie Froggy In Paris serves up a successful Cheese Souffle. 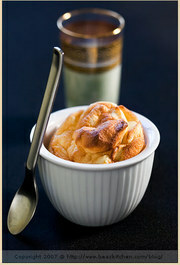 Freya of the UK cooked up a Roasted Butternut Squash, Goat Cheese, and Thyme Souffle at Writing at the Kitchen Table. 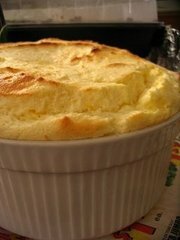 Arfi of New Zealand’s HomeMadeS got up and close and personal on her version of the Cheese & Veggie Souffle. 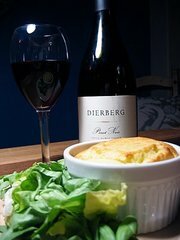 Heather over at The Culinary Chase contributed a beautiful Zucchini Souffle. Ellie from Australia’s Kitchen Wench outdid herself with her gorgeous Frozen Passion fruit Souffle. Julie at A Mingling of Tastes lightened things up with her beautiful Banana Souffles. Veronica of the eponymous Veronica’s Test Kitchen shows us her grown up Oatmeal Souffle. Francesco of The Food Traveller gets original with his Onion Stuffed with Ricotta Souffle. Peabody of Seattle’s Culinary Concoctions by Peabody makes us drool with this divine Six Cheese Souffle with Black Cherry Sauce. Over at IsItEdible, Ed puts out a gorgeous and fluffy Broccoli Souffle. Sarina gets small but intense with her Miniature Hot Pepper Souffles over at TriniGourmet. 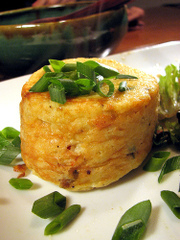 Maia from Maiapapaya puts a Southern twist on souffles with her Cheesy Grits Souffles with Corn, Bell Pepper, and Green Onions. Brigitte at Kuechendunst aus Singapur cures your sweet tooth with her Cherry soufflé in Chocolate Crépes with Dulce-de Leche yoghurt Ice Cream and Cherry Sauce. Meeta at What’s For Lunch, Honey? thinks her lovely Fluffy Dream Souffle stands up to the challenge! This event’s founder, Barbara at WinosandFoodies, chooses cleanliness over blogliness with her entry. Anh of Australia’s Food Lover’s Journey has both style *and* substance with her Cheese Souffle Tartlets. Joey from 80 Breakfasts overcomes her fears and produces a gorgeous Spinach and Cheese Souffle. 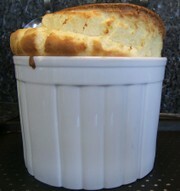 Piperita of Italy’s The Kitchen Pantry had great success with her Orange Souffles. 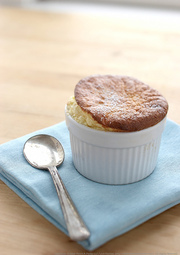 La Tartine Gourmande‘s Bea contributed not one but two gorgeous souffles: Vanilla Souffle and Crab & Saffron Souffle. 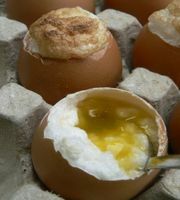 Bron of Bron Marshall gets creative with these Baby Breakfast Souffles. 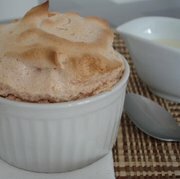 Marsha from So Epicurious Its Hurts does it freestyle with her Souffle Things. Esther of Paris’ Boxcar Kitchen gets sweet with her Sweet Lime Souffle. Amanda & Tyler from What We’re Eating tag team the competition with a heavenly sounding Chipotle and Bleu Cheese Souffle. 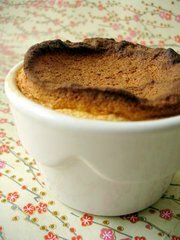 Patricia of Technicolor Kitchen wows with this unusually flavored Guava Souffle with Catupiry Sauce. Brilynn of Canada’s Jumbo Empanadas does things her own way with her two souffles: Roasted Red Pepper Souffle and a Chocolate Souffle. Alpineberry‘s Mary takes part with her beautiful Salzburger Nockerl with Nutella & Raspberry Jam. 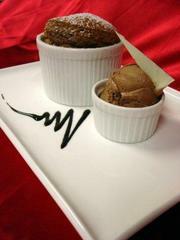 Ramya of Cascading Flavors gets twisty and inventive with her Double Treat Souffle. My Georgia neighbor, Lynne from Cafe Lynnylu, serves up this incredible Apple and Aged Cheddar Souffle. I-Ling of Feed Me! I’m Hungry! 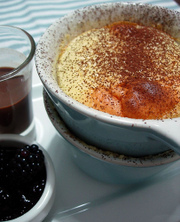 handily overcomes her "sinkerphobia" with this scrumptious Vanilla Souffle with Chocolate Sauce. 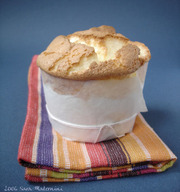 Mia from Munich’s Nosh gets close up on her absolutely mouthwatering Cold Lemon Souffle. 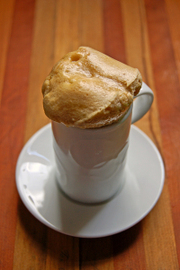 Boo of Masak-Masak takes originality to a new level with two souffles: Egg Souffle and Toblerone Souffle. Lara of Ratatouille in Rio works her way around the no-peeking rule with her light and delicious Souffle of Passion Fruit. Haalo of Cook (Almost) Anything At Least Once gives the contest a jolt with her Coffee Souffle. 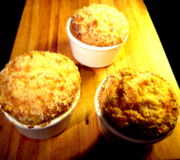 J from London’s Have Fork Will Travel serves up a trio of Souffle Potatoes. Rachel from Rachel’s Bite shares a delicious (and beautifully propped) Tortino Gorgonzola. 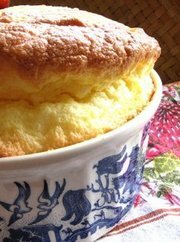 Renata at Little Bouffe sweetens up with her lovely Meyer Lemon Souffle. 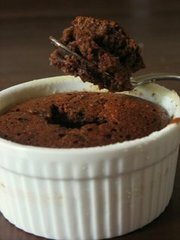 Helen from Charleston’s Tartelette digs into HHDD with her yummy sounding Chocolate Kahlua Souffles. Isis at Yambalaya shows us how its done – literally – with her Spinach Souffle. Lastly – but certainly not least – Valentina of Trembom (in English) shares her incredible flavor combination in her Banana and Passion Fruit Souffle. Wow! So many gorgeous recipe to try!!! A difficult voting and, above all, difficult to choose which one to try at home first!! A brilliant round up Tami. Thank you. What an amazing collection of soufflés. I think I might have to claim founders privileges and get thirty votes. Wow that is a lot of souffles…going to take awhile for me to decide. Amazing job Tami – great round-up. I feel honored to be a part of this beautiful event! 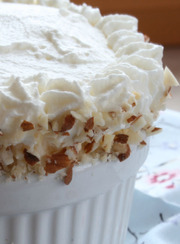 This roundup is amazing – I love the way you describe each and every souffle. Tami, You have done such great work. And thank you! It will be pretty hard to vote!! I will revisit these posts a few times. Till next time. Tami, thanks for hosting HHDD. 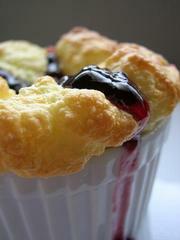 What a beautiful and delicious-looking roundup of souffles! I don’t think I could decide on a winner – even with a taste test! They all look so good. Beautiful! They all look amazing. What are the odds that 10% of the people would choose passion fruit for their souffles? Funny! wow!! great entries these are all!! hard vote this time. good job, tami! I am so bummed that I missed out. I actually made a souffle although because I have been away, I never got to post it. Oh well. Wonderful round up! You are right…I don’t know how I am going to choose a favorite! Everything looks so good! How to vote for one when I would like ALL. Your theme really brought out the best in everybody! Great job. What an amazing collection of soufflés. I think I might have to claim founders privileges and get thirty votes.